Urbanists have long been enamored with the big idea. Ages before Daniel Burnham urged us to "make no small plans," the possibility of the grand plan, the megaproject and the utopian vision has enthralled not only the kings and queens who supported them but the architects and planners whose duty it was to realize the grandiose vision of whatever empire or tribe or nation-state to which they owed fealty. Aprés Haussmann and the Ringstrasse, the grand idea became more and more associated with with the idea of modernity, of progress and the future, and ultimately with the rationalist fantasy which led us to believe that we could plan the perfect city, be it Brasília or Ciudad Guyana or Letchworth or Columbia, Maryland. The spectacular failings of modernism, whether through the production of the ugly, the unequal, or simply the unsuccessful, have been chronicled by everyone from Jane Jacobs to Joel Garreau, who of all people has my favorite line to describe postmodernism as "that school of thought whose bottom-line observation is that human reality is always more complicated than any structure you can erect to describe it." Alas, we planners and architects are inherently modernist, at least if one thinks of modernism as the ability to understand the world enough to act to change it in the way intended. Modernism has always meshed well with capitalism, and lately neoliberalism, which has unleashed the megaproject anew, redevel oping neighborhoods from Mumbai to Shanghai, in the name of both progress and global competitiveness. We have now gone beyond the neighborhood to Masdar City (above) and Nanocity (right), or perhaps new urban mountains in Germany, most in the name of solving one of this generations great problems, the environment. As easy as it is to poke holes in these neomodernist dreams, so easily slave to profit or spectacle or the perniciousness of accumulation by dispossession, we can not deny the necessity to make real changes and take real leaps. This is partly a mental exercise - even consummate critics like Henri Lefebvre and David Harvey have recognized the need for utopian thought. Yet it also requires actual action by actual people in actual space - not the repackaged neomodernism that seems to be cropping up everywhere, a literally redesigned utopia that ignores the social, the political and the very notion of a just city or the right to the city - but one which is capable of taking on the profound and intertwined crises of poverty, injustice and the environment. This requires not a new modernism but a paramodernism, something altered, contrary, beyond and alongside what has come before. More on what that might be in the next entry. 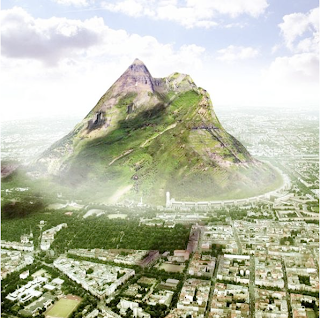 Credits: Image of a proposed mountain in Berlin from The Architects Journal. Image of a Masdar City from www.masdar.ae. 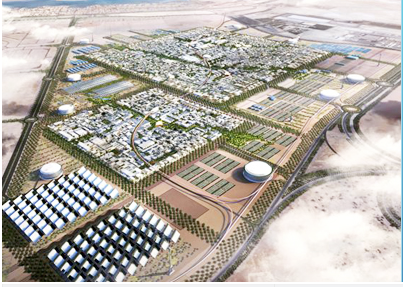 Image of Nanocity from nanocity.in. what, but the "forcible overthrow of all existing social conditions", is capable of taking on such deep crisis, mr schafran? how will you avoid emptiness without falling in inescapable class traps, sir? cant wait for that next entry!